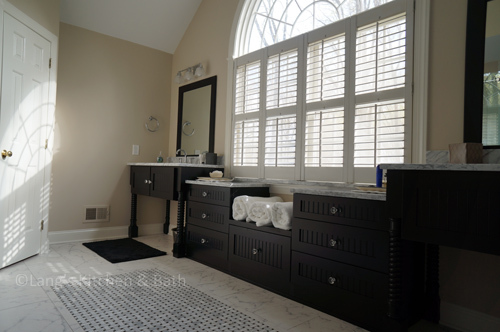 This master bathroom in Doylestown, PA, offers a large window that lets in natural light to contrast the black vanity cabinets. This master bathroom design in Doylestown, PA utilizes the large window as a central feature and a source of natural light. 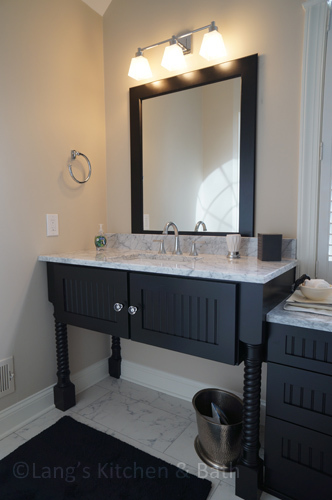 The black vanity cabinets are built on either side of the window with a window seat and more handy storage underneath. White tiles and a marble countertop contrast beautifully with the black cabinets, and the glass shower enclosure adds to the bright atmosphere of the design.